The Jungle Book is a remake of the 1967 Disney animated film. Both are screen versions of Rudyard Kipling’s classic book about Mowgli, an orphaned boy, rescued by Bagherra the Panther, and raised by wolves. 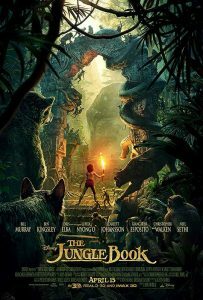 The earlier Disney film is an animated film with characters hand drawn (the standard at the time); the current film, directed by Jon Favreau (director of Iron Man), uses computer generated (CG) technology to make the jungle and animals look more realistic. As the story goes, Shere Khan the Tiger, wants to kill Mowgli because Mowgli’s father seriously burned Shere Khan using fire (the “red flower” as the animals call it). Shere Khan killed Mowgli’s father, but he still harbors a grudge because of the burning. Shere Khan tells the wolves who raised Mowgli that he will not tolerate the Man-cub’s (as the animals call him) continued existence with them; Mowgli must return to human civilization. Shere Khan threatens the wolves, and indeed, the peace of all the jungle animals, unless Mowgli either returns to the humans, or is killed by the Tiger. Reluctantly Mowgli sets out to leave the home he has known to return to the humans he does not remember, under the watchful eye of Bagherra and Baloo the Bear, who rescues the boy from a snake. The Jungle Book has opened to critical acclaim and has also done very well at the box office. The big draw may be the appeal of the earlier Disney film which many parents of children have no doubt seen. A particular draw to the current version is the CG animals and jungle created by Favreau and his team, which has been widely advertised over the last several months. The Jungle Book makes good use of CG technology, reminding me at times of the great effects of Avatar. The story itself contains elements from both Tarzan (which is getting another remake this year) and The Lion King. Despite its state of the art technology, I didn’t find The Jungle Book all that appealing. One of the reasons is that it is rather solemn and serious in tone. More humor could have helped immensely! Baloo, voiced by Bill Murray, is comic relief, but he is not funny enough. At one point, Baloo begins to hum and sing bits of the catchy tune “Bare Necessities” from the 1967 film. I wish he had broken out to a full production number of this to give some much needed energy to the movie! Unfortunately, the song dies out quickly. The Jungle Book could have used some of the offbeat humor and characters that made Zootopia so entertaining earlier this spring. I wish they had found some sloths in this jungle! Even the CG jungle and animals began to wear on me (and my 3-D glasses) after a while. The animals don’t quite look life-like. For example, Shere Khan never looks anywhere near as real as the terrifying tiger in the boat in The Life of Pi. For all the money spent on this new version of The Jungle Book, I was not captivated by the computer technology or the adaptation of Kipling’s classic story. Somehow I think I might like the 1960’s version with its “Bare Necessities” better!